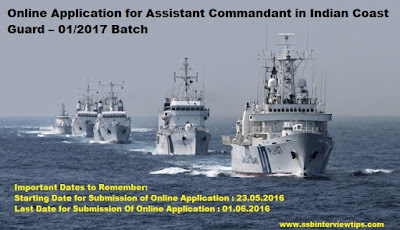 Indian Coast Guard invites application for the post of Assistant Commandant for 01/2017 Batch. Unmarried Indian male and female citizens are eligible to apply. For General Duty & General Duty (Pilots): Candidates Should hold a Bachelor’s degree of recognised university with minimum 60% marks in aggregate and Mathematics and Physics as subject up to intermediate or class XII of 10+2+3 scheme of education with 60% aggregate marks in Maths & Physics [Candidates not in possession of Physics & Maths in 10 + 2 (Intermediate) level are not eligible for General Duty (GD) & General Duty Pilot]. For Technical branch (Mechanical and Electrical): Engineering degree with 60% marks in aggregate or Should have passed Sections A and B examination from the Institution of Engineers (India) in Naval architecture or Mechanical or Marine or Automotive or Mechatronics or Industrial and Production or Metallurgy or Design or Aeronautical or Aerospace or Electrical or Electronics or Telecommunication or Instrumentation or Instrumentation and Control or Electronics and Communication or Power Engg. Or Power Electronics. For (Commercial Pilot License-SSA): 12th class pass with 60% marks in aggregate and should possess current / valid Commercial Pilot License (CPL) approved by DGCA on the date of Preliminary Selection. For General Duty (Women): Should hold a Bachelor’s degree of recognised university with minimum 60% marks in aggregate. Mathematics and Physics as subjects up to intermediate or class XII of 10+2+3 scheme of education with 60% aggregate marks of both subjects. For General Duty: 01 Jul 1992 to 30 Jun 1996 (both dates inclusive). For General Duty Pilot: 01 Jul 1992 to 30 Jun 1998 (both dates inclusive). For Technical branch (Mechanical and Electrical): 01 Jul 1992 to 30 Jun 1996 (both dates inclusive). For Pilots (CPL): 01 Jul 1992 to 30 Jun 1998 (both dates inclusive). For General Duty (Women): 01 Jul 1992 to 30 Jun 1996 (both dates inclusive). Note: The upper age limit for OBC/SC/ST is relaxable as per Govt. of India rules in vogue. 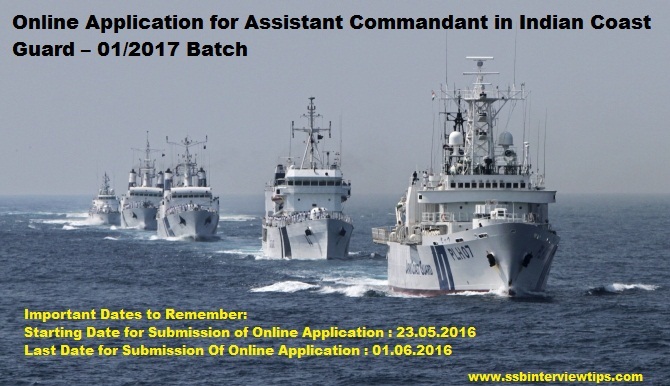 How to apply: Interested candidates may apply Online through the website www.joinindiancoastguard.gov.in from 23.05.2016 to 01.06.2016 till 5 pm. Certificate number of 10 + 2 and Graduation degree.